A deaf and visually impaired pensioner hit a burglar over the head with his walking stick before sending him fleeing from his home on Merseyside. Angus McMeekin said he went "ballistic" when the perpetrator threatened to kill him and his dog, Sven, at his house in Litherland on Friday. "I might have had a triple bypass, but no-one messes with this Scotsman," he said. Police said the 76-year-old should be "commended". Mr McMeekin discovered the intruder after letting the dog out into the garden. "As we walked back through the house Sven stopped at the bedroom door and started growling as they do. "When I looked at the floor I could see snowy footmarks, I opened the door and there was a guy hiding behind it. "I said, 'What do you want?'" He said the burglar demanded his money, saying if he did not hand over any cash he would kill him. Mr McMeekin replied: "You're not getting out this bedroom, that's for sure." 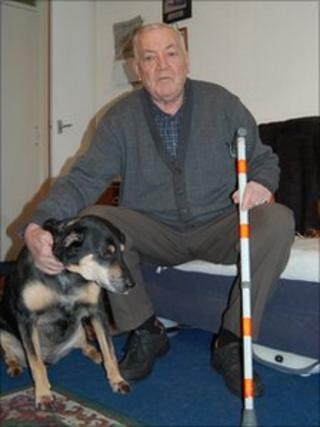 When the offender threatened to kill his dog, he said he hit him hard with his walking stick, which is white and red to show he is visually impaired and hard of hearing. "The dog went for his legs, growling and biting at him. The guy then shouted 'let me out'." Mr McMeekin told the BBC: "He shouldn't be walking the streets - imagine asking a Scotsman for money." Det Supt Neil Blanchard, of Merseyside Police, added: "This was a very upsetting and unpleasant experience for the victim. "He should be commended for the brave actions he took in defending himself and his property." He appealed for anyone with information to come forward.